Traditional needn’t be dated. When it comes to traditional interior decor, we often think it can make a home look outdated and unfashionable. This doesn’t have to be the case; we prefer to think that traditional is timeless. When done well, adding traditional tiles to your home can make any space feel grand and luxurious. Traditional tiles, such as Victorian patterned tiles or retro-inspired tiles can make a statement in your home. Use them to create a centrepiece or focal point to catch the eye and enhance your current decor or even revamp an entire room. 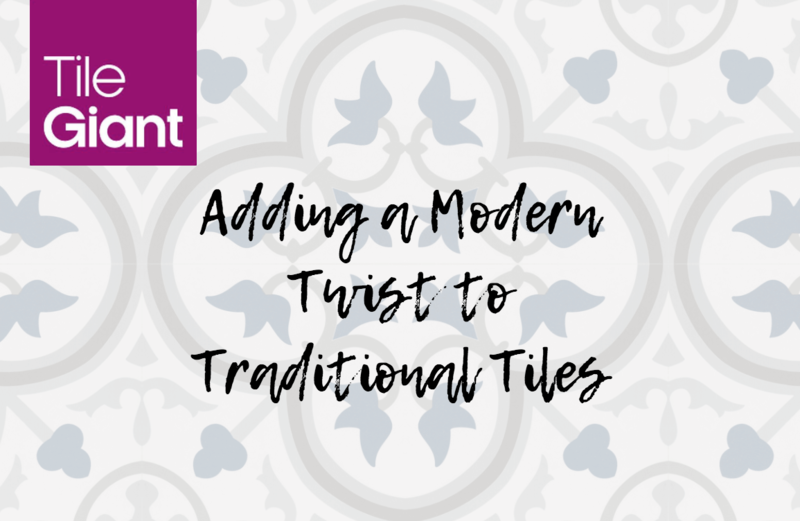 We’ll show you three ways to style traditional tiles to add a modern twist to your home using our Chalkwell, Pamplona and Cementum tile ranges. First though, here’s why traditional tiles are proving to be so popular. What Makes Traditional Tiles So Enduring? Tiles in traditional styles have become increasingly in demand in recent years. They allow you to easily add dimension to a room, and create a luxe and expensive feel, without having to spend a fortune. The most sought after styles are often bold and intricate patterns which take inspiration from classic Victorian flooring. It was during the Victorian era that exquisite, medieval patterned floors often combining fleur-de-lis and quatrefoil designs were re-discovered and brought back to life in the Gothic Revival movement. The Houses of Parliament, Liverpool Cathedral and Victoria Baths and the Town Hall in Manchester are all examples of the original use of decorative Victorian patterned tiles. These styles and patterns are still so popular today; with their timeless designs, they aren’t set by trends so will look beautiful in your home for years and years to come. 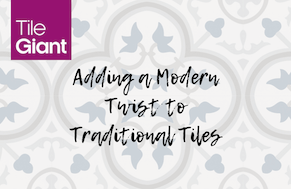 It’s easy to update the look traditional tiles give to fit with upcoming interior trends, by simply switching up furnishings such as curtains, cushions and rugs to the latest on-trend colour. Although patterned and Victorian-inspired tiles are a very popular style of traditional tiles, the Chalkwell range proves you don’t need loud patterns or intricate designs to add a touch of class to your home. These plain, retro style tiles are simple but effective. Coming in a range of staple neutral colours they effortlessly add a rustic, yet modern country home feels to any kitchen or bathroom. Our favourite colourway in the range is the Duck Egg Blue Chalkwell tiles, perfect for adding a subtle pop of contemporary colour to your kitchen whilst also keeping a traditional, rustic look. Opt for copper kitchen accessories to add a modern, metallic edge contrasting with the more traditional tiles and cabinets, adding a little warmth without compromising on style. Complement the rustic wooden worktops with a reclaimed wood dining table, and velvet dining chairs to add texture and an element of luxury to the room. 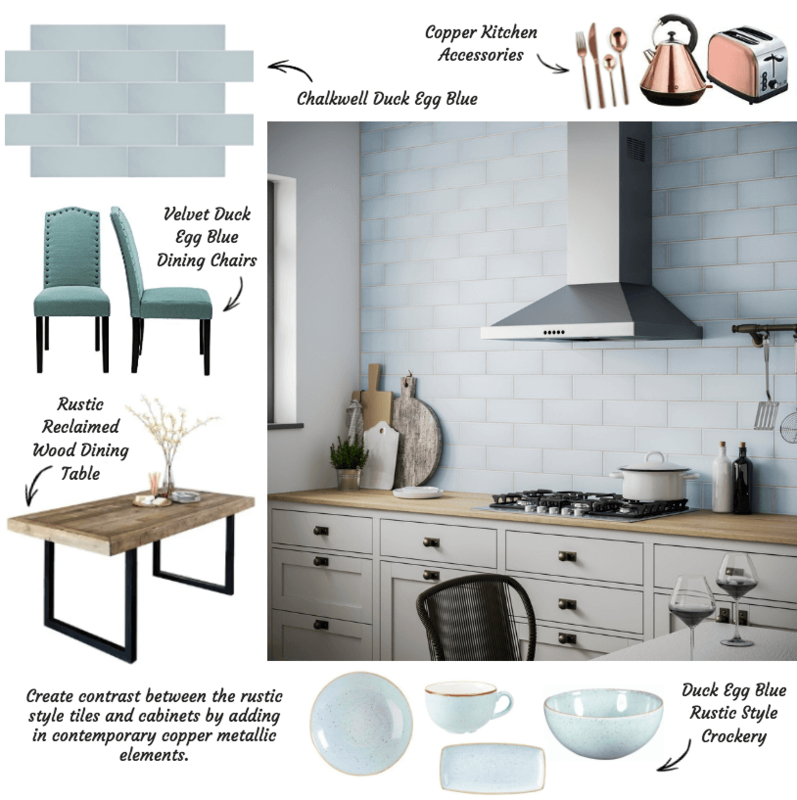 The chunky wooden chopping boards and duck egg blue stonecast crockery tie all the elements together to create timeless rustic charm and a modern, country-kitchen feel. For something a bit more eye-catching and statement, our bold patterned Pamplona tiles are the way to go. The Pamplona range takes inspiration from classic Victorian flooring, with its use of fleur-de-lis and quatrefoil elements it can make quite the statement. Its highly decorative and original design makes it a perfect focal point in any room. As well as being super stylish, these tiles are practical too; their slip rating of R10 means they are ideal for use in bathrooms, with a low risk of slips and trips. 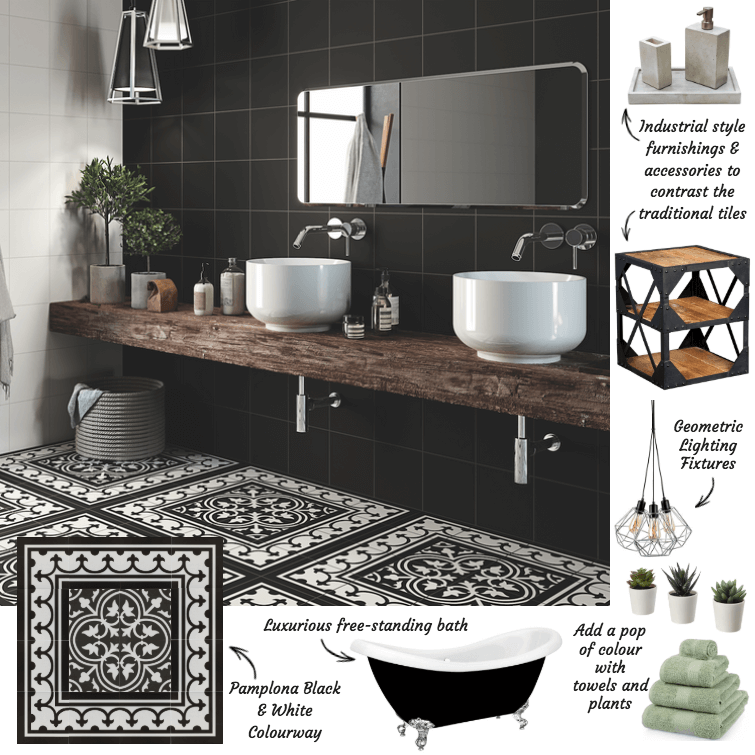 Styling a modern monochromatic bathroom with Pamplona floor tiles in the White on Black colourway creates a contrast between the traditional pattern and clean lines, adding a contemporary twist to the classic design. Combine with trendy, industrial style accessories, fixtures and furnishings to give a slightly more edgy feel to the room, without taking away from the focal-point statement tiles. Adding a hint of calming colour to the room with sage green towels and small plants helps to break up the monochrome colour scheme. If a monochrome look isn’t for you, and you’d rather tiles that add a pop of colour, the Pamplona range also comes in two other colourways: Black, White & Red and Black, White & Blue. If a feature tiled wall is more your style, our Cementum range of tiles are the perfect choice to create your desired look. These small square tiles come in a range of different patterns in black, white and grey tones; use sparingly and mix & match the designs for maximum effect. Feature splashbacks in kitchens and bathrooms or a statement fireplace surround in a living room are just some of the focal-points you could create with Cementum tiles. The intricate designs of the Cementum tiles work well to create a statement wall against the side of a kitchen breakfast bar, adding interest in an area that would usually be quite plain. Style these tiles by using a mixture of the different patterns in a random layout to make these quite traditional style tiles much more modern and on-trend. 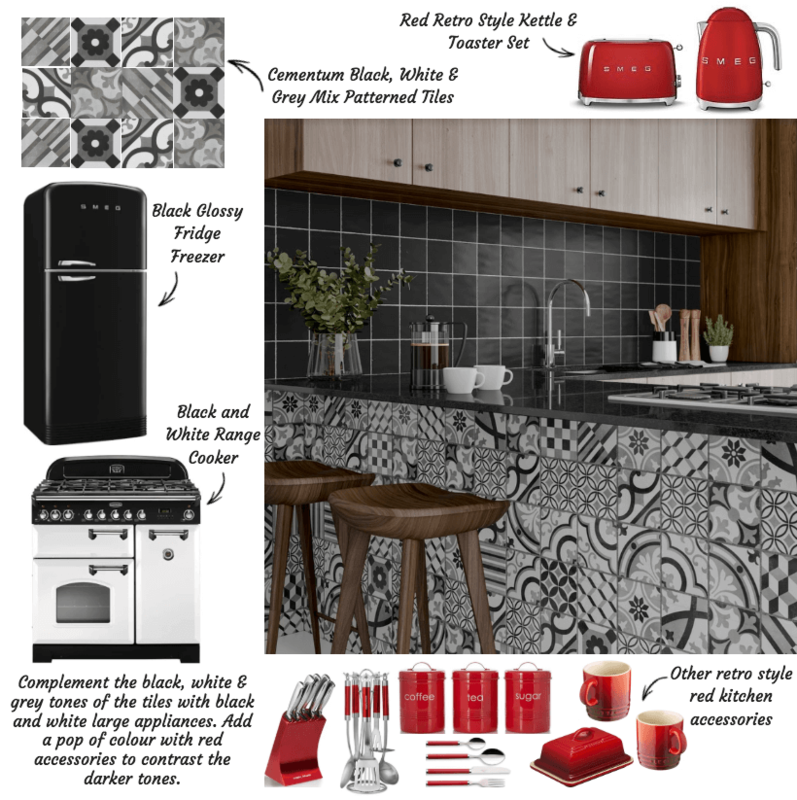 Adding retro style appliances and bursts of colour with red kitchen accessories contrast with the darker tones in the tiles to add dimension and a fun element to the room. The black glossy worktops and smooth wood kitchen cabinets add another texture to the room, tying it all together effortlessly. Whether you want to go bold with a full patterned tiled entrance hall or make a more subtle statement with a small feature wall, there is a range of traditional tiles to suit all purposes and visions. Mix and match traditional tiles with more contemporary accessories to add a modern twist to your home. We offer extremely competitive pricing on our entire range of tiles and likewise, these traditional tiles are both competitive for retail and trade. 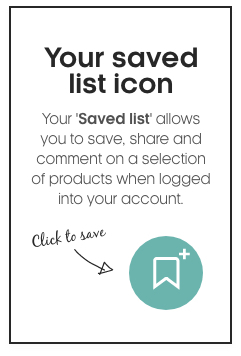 Our stock is widely available in our 100+ showrooms which are open to browse at your leisure. Alternatively, if you’d prefer to shop traditional tiles online, we can supply you with samples delivered for free. Not only that but Tile Giant also offer a buyback service on any unused tiles, meaning you get value for money.